This week we're looking at how to approach appointments with your child and I'll share some top tips! I'm going to look at prepping before - you and your child - and then the practicalities of attending them. Almost every appointment starts with the doctor or therapist asking you to update them and if you’re not prepared it can end up with the most random account of the time since you last saw them. In the run up to appointments try and pre-empt some of the questions and document the answers. e.g. before a respiratory appointment I'll write down a sleep diary for a few nights, and maybe record an audio of Daniels snoring. If it's speech therapy I might write down some of the spontaneous sentences Daniel has said, or write down new words or sounds. Videos of your child are often helpful in therapy as they rarely do what you know they can at home! You obviously don't want to spend the whole appointment showing these to the therapist, but at the start when giving an update I might say "and I have a video of x and y on my phone if that's helpful to see". Even as a baby we would tell Daniel in advance he was going to the hospital to see his doctor who wanted to see him about his heart / breathing / blood. Just a broad description of the specialty. We do a practice of what the doctor will want to look at. So we'll say "Dr B will want to check your breathing. You'll pull your top up. They'll put the stethoscope on your chest and listen to your breathing." Daniel's so good at it now he pulls out his hearing aids and offers his ear to every doctor in case they want to look inside his ears (which he used to hate). A nurse in cardiology gave us a top tip of photographing (we also took a short video) Daniel getting an echocardiogram so we can show that to him in advance of his next review. Just so he can remember what happens, put a visual to what we're describing and see it's not painful. If your child has regular tests done it may be worth asking a doctor if you can record one so they can watch it in advance of appointments. Dr Ranj on CBeebies has a great programme on the various things your child may be experiencing called Get Well Soon. There's ECGs, NG tubes, X-rays and cannulas, all accompanied by annoyingly catchy songs too! When Daniel got bloods done last week, it took a good few minutes to get all the vials filled and he was so perfectly still and calm and kept saying he was like Dr Ranj, so that obviously was a comfort to him that time! Have a checklist – if you don’t use a checklist you will invariably forget something important, normally (for me) their red book! If you can, pack the bag the night before. A double appointment day - Rory in one hospital, Daniel in another. Definitely need to pack the night before! Timing - plan your timings carefully. If your appointment is early afternoon at a hospital you will hit the visiting time rush on the car parks, as well as those attending outpatient clinics. I now know the time I need to leave for parking at the two main hospitals we attend. If it’s your first time going or it’s a different time than normal, ask around to make sure you know. Plan for hangry children – have a snack and drink ready for your child (and yourself) as the food in the vending machines at hospitals is expensive and not very healthy or easy for children with health problems to eat, like crisps. I have a little child sized bag that Daniel carries himself with a little treat like fruit winders, or bag of dried fruit – can help occupy the hungry wait! Toys/books – some waiting rooms are good, particularly if it’s a children’s hospital or clinic. But I’m continually amazed at how bad some waiting rooms are, some broken plastic toys with parts missing or one wooden bead table which can only occupy them for a short while. I tend to bring a book they haven’t read in a while, a sticker book and a small toy. And a game of “Can you see?” always passes some time as well as serving as good therapy! (e.g. Can you see something green? Can you see a wheelchair? Can you see the letter H?) For particularly long appointments the trusty iPad comes along! Siblings – my final tip for attending appointments is to think about those where it would be better to try and arrange for someone to stay at home with the other siblings. I do the vast majority of appointments by myself with all three boys in tow. This can be an utter nightmare if Finn needs a feed, when Rory runs off and Daniel is distracted and needs me to be helping him. For speech therapy, audiology and if possible optometry I get Colin to stay at home with Rory. This allows Daniel to concentrate better and therefore do better. For all other appointments I go with all three of them and wing it. 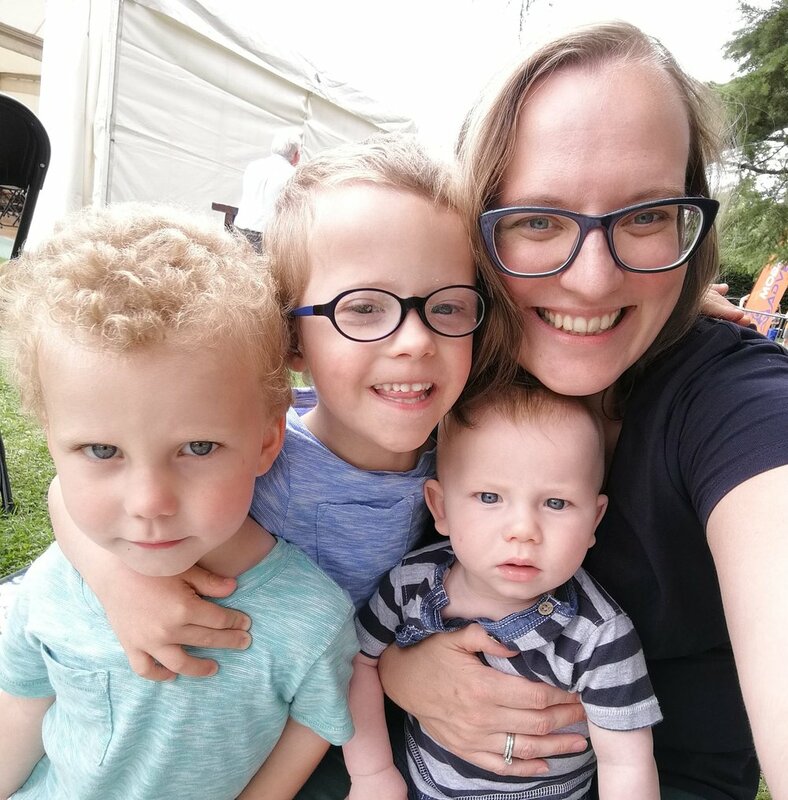 At appointments I often feel like I am THAT mother, with the out of control children who is sitting sweating and struggling to answer the questions and concentrate on the answers but apparently it doesn’t come across like that to others. I had a mum come up to me last week and say I was a hero for doing appointments with all three of them and I seemed so calm. It was a lovely confidence boost so smile at the other mums and dads in the waiting room and make sure to tell others they’re doing a great job too!